HolloWatch: Ian Holloway has a book out! Great news, HolloWatch fans. 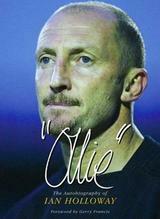 Ian Holloway’s autobiagraphy, Ollie, is in the shops now! A whole book full of the Plymouth boss’ perculiar ramblings, mixed metaphors and wonderfully eccentric turn-of-phrase. The book apparently contains the chapter titles: ‘Ollie and the Chocolate Factory’, ‘Double Ham & Eggs’, ‘Marvin Hagler’s Eyes’, ‘Bring on Los Galacticos’. Click here to buy Ollie’s book from Amazon.